I thought that I would share some of my favorite rewards and referral programs with y’all! These are super handy for saving and even earning money! This type of thing is a big deal for a stay at home homeschool mom like myself, and I’m sure it will be super beneficial for you, too! My little family may receive compensation of some form when you use the referral links below, but it will cost you nothing to help us out! You get a $30 credit for using my referral link, and I get one for $10! After you join, you can give $30 to your friends and receive $10 for yourself! I absolutely love the way this is set up, because we get to really bless our friends while rewarding ourselves a bit! Who doesn’t need something from Advanced Auto, seriously?? I am giving you a $20 off coupon for Vistaprint! In return, I get a $20 credit for any order my friends make that’s over $40! You can do the same! My Reader Rewards is a quick and easy way to get FREE books simple by doing simple tasks and sharing with friends! I have been using this for years, and most holidays I have books from them for all three of my kids gifts. Schoola Clothing, follow the referral link for an immediate $10 credit to order, plus more when you refer friends! You can also choose to send clothes to them and benefit the school of your choice, since a portion of their profits goes to schools designated by the people who send them in. We have been super happy with everything we’ve gotten from them. At Survey Savvy, there are multiple ways to earn your rewards. You can do surveys, earn $5 a month per device you download Savvy Connect onto, and you can do referrals! Referrals earn up to $15 for direct referrals and up to $6 for their referrals! Here’s where you can get discounted gift cards with a guarantee from the seller! With their referral program, you and your friend get $5 credits per referral! 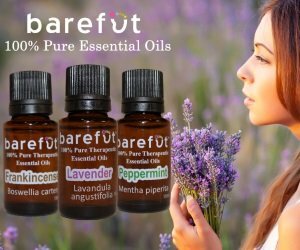 With Barefut Essential Oils, you earn 5% back on everything you spend, plus they have ever changing free sample kits, frequent sales and free shipping with any order over $25! This store has all things outdoors, and you get a $10 credit just for clicking my referral link, plus you can earn more $10 credits just for referring your friends!! This would be an amazing place to get gifts for people like my husband, the eternal outdoorsman! Doggyloot gives a free credit you can use immediately, with free shipping. Join the referral program to get more freebies for pets and pet lovers! They also donate to shelters with their profits, which I love! Evitamins carries a vast array of health items, from vitamins to lotions to grocery items and more! Get a $5 credit automatically when using my referral link! Earn credits from referrals and product reviews! Which of these programs are you the most excited to try? I think I included something for absolutely everyone, and truly hope these help someone out! I have appreciated the people who shared their frugal tricks with me, and want to pass it on to you! Want more savings? Learn about some great Happy Birthday Freebies!! To interact with likeminded frugal folks, please feel free to join my no-drama-allowed Facebook group Naturally Frugal and Healthy on a Budget! Categories: Frugal Family, Sites for Savings | Tags: Advanced Auto coupon, affordable healthy products, back country, best reward programs, book club, buying school clothes, Card Pool, cheap clothes, cheap pet supplies, cheap vitamins, discount gift cards, doggy loot, evitamins, free books, free clothes, my reader rewards, reading club, referral programs, rewards program, saving money on Christmas, Schoola | Permalink.